The holiday season is upon us, and while the weather outside may not be frightful, there are still plenty of delightful wintry things to do in Austin this time of year. For your perfect winter evening, start at Whole Foods’ flagship store at 6th and Lamar. First, enjoy dinner in their café, which offers a variety of foods to please every palate. Then head out to their plaza, where for the second year in a row they have set up an ice-skating rink on top of the building for a winter sport few Austinites get to experience. 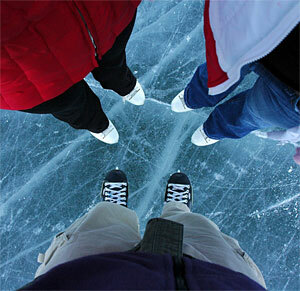 The rink will be open until January 14. After skating, head over to the Warehouse District for dessert at Halcyon. There they serve tableside s’mores, complete with graham crackers, Hershey bars, marshmallows, and a small fire to get the mallows toasty. They even include wetnaps for after-snack cleanup. Halcyon s’mores also make a perfect first date – trust me, chicks dig this stuff. Now that you’ve finished dessert, it’s time to walk off some of that sugar. Check out the Trail of Lights in Zilker Park, an Austin tradition since 1965. The trail, which runs through December 23, consists of a mile-long display of lighted scenes, culminating in the infamous Zilker Tree, a 155-foot moonlight tower draped in streamers of Christmas lights. Look out for children spinning around underneath the tree. If the Trail of Lights is a little too commercial for your tastes, you can always head up to 37th Street just east of Guadalupe to see houses decorated by people who are serious about their Christmas lights. While you might be tempted to stay in your car and drive down the street, most people advise that you walk so you can really see the amount of detail that goes into these displays, which usually stay up until around January 1. By the end of the night, you’ll be so full of holiday spirit that you might actually want to spend time with your family. Luckily, Christmas only comes once a year.